This part contains the protein coding sequence for the dCas9 originating from Streptococcus pyogenes. This protein is a catalytically-dead Cas9 variant, which lacks endonuclease activity. It is used for gene repression using CRISPR-interference. It can been seen as an improvment of part BBa_K1026001 since the illegal EcoRI site has been removed and the part was fully sequenced (see experience). Overexpression of dCas9 may cause cytotoxic effects , therefore we recommend expressing it using an inducible promotor. In this part the start codon (ATG) starts directly behind the XbaI site and not at the last A of the XbaI site. This may lead to reduced efficiency of expression when combined with RBS's from the iGEM repository, but more importantly this needs to be taken into consideration when creating fusion proteins with this part to ensure that no frame-shifts occur.
. This part was validated experimentally in the same experiment as dCas9VRER by iGEM Groningen 2017. For this experiment we have designed four gRNA's that target GFP. Two of this gRNA's bind to sequences flanked by NGG (1&2) and two bind to a sequence flanked by NGCG (3&4). These gRNA's were inserted into the plasmid pSB3C5 containing a pLacGFP construct as well. For spdCas9 and dCas9VRER expression those parts were put into a pBad vector in which they are expressed behind an Arabinose inducible promoter. 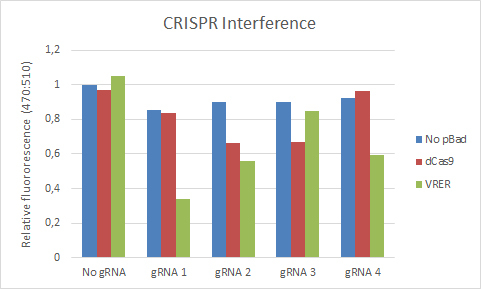 From figure 5 it can be seen that all fluorescence values are quite similar for the samples without gRNA. Further we can see a clear decrease in the relative fluorescence of dCas9 in combination with gRNA 2 and 3. For gRNA's 1 and 4 the relative fluorescence of the dCas9 is similar to that of the samples without the pBad vector.